Feb 12 & 13 may be crucial and we are waiting for it and our fight will continue if it is pass in Rajya Sabha too- AAPSU . All Arunachal Pradesh Student’s Union ( AAPSU ) leaders appealed to the people of state irrespective of political party and different organisation to come out openly against the citizenship Amendment Bill (CAB)-2016 which is against the interest of the indigenous people of state and NE region. AAPSU vice President Mije Taku and General Secretary Tobom Dai who was a part of the AAPSU delegation and team member of NE Students Organisation at New Delhi to meet several leaders of national political party on the issue of CAB. Talking to media on their arrival at helipad here AAPSU Vice President Mije Taku said that we make lobby and campaign with several leaders of TMC, Shiv Sena, JDU, BSP and we apprise our sentiment on CAB. We meet AICC President Rahul Gandhi and inform him of our several issue and sentiment of indigenous people of the region in this regard. He said that this bill is anti indigenous and political motivated one. We are getting to know from BJP senior leader Ram Madhav the bill may be brought in current session by way of supplementary bill in Rajya Sabha. The ruling BJP may do this by bulldozing all protest and our sentiments. Feb 12 & 13 may be crucial and we are waiting for it and our fight will continue if it is pass in Rajya Sabha too. We are seeking an appointment with Prime Minister of India who is visiting Arunachal Pradesh soon, we are planning to submit a memorandum in this regard and wanted to have a discussion with PM. 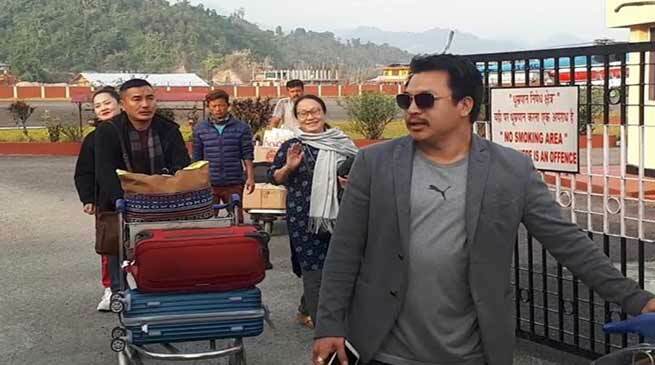 However he said that the young Chief Minister Pema Khandu may understand the sentiment of the indigenous people of state and unlike other CM and senior leaders of the region he too may apprise the resentment of the indigenous people of state to the central government. We have been protesting against CAB in state and all people should come forward and join hand to fight against the CAB which is against the indigenous people of state and region.